Bulgaria is the perfect destination for a summer break – visit the coast and you’ll find golden beaches that go on for as far as the eye can see, while further inland the dramatic natural beauty of the country will quickly cast its spell over anyone with a taste for the great outdoors! Many visitors to Bulgaria choose to travel via the large and convenient airport situated just to the south at Istanbul, and here at AroundBulgaria we’ll be able to offer you the perfect transfer service – getting you quickly to your destination in Bulgaria, for some of the most affordable rates you’ll come across. We offer both Ataturk and Sabiha Gokcen Airport transfers to Bulgaria. All of our taxi and transfer services are provided in state-of-the-art vehicles, ranging from fast, modern cars through to fully equipped minibuses for larger groups. Travelling from Istanbul to Bulgaria with your children? We can cater well to family groups, with a smooth, comfortable ride… and even including complimentary children’s car seats for your younger passengers. All of our vehicles are maintained to a pristine standard of cleanliness, as well as meeting the most stringent of technical specifications. Enjoy perfect air-conditioning, comfortable seating and a fresh, smoke-free environment! We also provide Internet access in our vehicles – allowing you to surf the web, or catch up on emails after your flight! We never ask our customers to pay for transfers in advance… instead, payments are only collected once you’ve arrived safely at your destination. What’s more, our prices are always fixed at the rate which was first quoted to you over the phone. We’ll never add more to your bill, no matter how many of our complimentary services you use. Even in cases where your flight is delayed and our drivers need to wait for you, you’ll still only be charged the agreed rate. In addition to our comfortable and reliable services that come as standard, we also provide a range of discounts available to our corporate or returning, regular customers. Remember to ask our advisors about these special savings when you book – you can even get a healthy discount on the cost of your return transfer, when you book both journeys at the same time! Book a taxi or a transfer service from Istanbul to Bulgaria right now – and buy yourself a little security! We look forward to welcoming you with a comfortable and professional transport service. 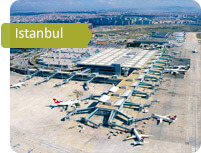 The international airport named for the first president of the Turkish Republic, Mustafa Kemal Ataturk, is located in the southwestern part of the pearl of Turkey, the city of Istanbul. From there, it is very easy to reach the historic center of the city which is called Sultanahmet. In that center, a multitude of landmarks which stand as symbols of Turkey are situated, such as Aya Sophia, the Blue Mosque, and the famous Topcapi sultan’s palace. That part of the city is the most popular with tourists who have arrived to Turkey on their own. It is also Istanbul’s most beautiful area, and it derived its name from the Sultan’s Mosque, Sultanahmet Camii. The international airport named for the first president of the Turkish Republic, Mustafa Kemal Ataturk, is located in the southwestern part of the pearl of Turkey, the city of Istanbul. From there, it is very easy to reach the historic center of the city which is called Sultanahmet. In that center, a multitude of landmarks which stand as symbols of Turkey are situated, such as Aya Sophia, the Blue Mosque, and the famous Topcapi sultan’s palace. That part of the city is the most popular with tourists who have arrived to Turkey on their own. It is also Istanbul’s most beautiful area, and it derived its name from the Sultan’s Mosque, Sultanahmet Camii. My journey to Bulgaria started from Istanbul Airport. By the way, I didn’t like that airport much. However, afterwards everything went on smoothly, and that is an understatement. The driver whom we booked via the Around Bulgaria.comsite pleasantly surprised us with his politeness, obliging manners, and the eagerness to help us. He was waiting for us in the arrivals lounge with a name plate, then he helped me carry my travel bag, and when we were seated in the car he asked if the air-conditioning temperature was too low; he offered us to choose music to our taste, and there was even a tablet in the car. On the way the driver did not bother us, trying to start a conversation, share his thoughts and philosophic views, like drivers usually love doing. But he answered all our questions and took care of our comfort and convenience. It was nice to feel cared for. At the end of the journey we paid in roubles, the driver gave us an advertising pamphlet of Around Bulgaria.com and also told us about the other services of the company (excursions, car rental with a driver). On the whole, my impressions of my stay in Bulgaria are very, very rewarding. Thank you very much! Istanbul is a vast and beautiful city, a modern metropolis built on ancient history – and for visitors, Turkey’s largest city boasts a fantastic range of tourist attractions, shopping streets, markets, cafés and museums. My journey to Bulgaria started from Istanbul Airport. By the way, I didn’t like that airport much. However, afterwards everything went on smoothly, and that is an understatement. The driver whom we booked via the Around Bulgaria.comsite pleasantly surprised us with his politeness, obliging manners, and the eagerness to help us. He was waiting for us in the arrivals lounge with a name plate, then he helped me carry my travel bag, and when we were seated in the car he asked if the air-conditioning temperature was too low; he offered us to choose music to our taste, and there was even a tablet in the car. On the way the driver did not bother us, trying to start a conversation, share his thoughts and philosophic views, like drivers usually love doing. But he answered all our questions and took care of our comfort and convenience. It was nice to feel cared for. At the end of the journey we paid in roubles, the driver gave us an advertising pamphlet of Around Bulgaria.com and also told us about the other services of the company (excursions, car rental with a driver). On the whole, my impressions of my stay in Bulgaria are very, very rewarding. Thank you very much!